Way back when, I wrote about not wanting to jinx my chances for a job at the South Pole by writing about it. Well, apparently, by not writing about it, I’ve jinxed the entire US Antarctic Program this year. You know I loved working at the Pole. Sure, I was “an indoor house pet” compared to the welders and cargo guys and GAs who spent all their time outside dragging stuff around on the ice while I sat at a desk and said things like “Hmmm – have you tried restarting Windows?” But it was still an intense, world-expanding, addictive experience. As Beth said when I was facing my first season with trepidation, there were two ways it could go wrong: one, I could hate it, and that wouldn’t be a problem. Because I’d hate it for three months and be done, with a good story to tell. The real danger was that I’d love it, and be hooked – that’s what she was worried about. Ah. Umm. Anyhow – it looked like family constraints and the calendar would make it feasible for me to go back this season, but with the new contractor shrinking staff at all of the stations, my old job disappeared. In 2010, there were ~210 people on station at Pole, this year the plan was to have ~160. Instead of five IT guys there’d be three, and “Helpdesk” wasn’t going to be one of them. Ah well – there were other opportunities: Holly’s team out in McMurdo looked like they might have a slot. McMurdo felt big and impersonal when I went through in 2010-2011, but I was immediately drawn to the Crary Science Support team. Karen was running it then, with Holly, Bill, Deke and… damn, I forget who was the fifth, and there was an awesome, “Team MacGuyver” spirit that I loved. If I was going to be in MacTown, I soooo wanted to be on Holly’s team. But they lost that slot, too. So the season wasn’t going to be happening. Ah well. There’s always next year, or the year after. Then, out of the blue, I got email from Denver: one of the vessels needed a sysadmin; the icebreaker – am I interested? Interested? Interested? I’m terrified. Most of the research stations stay put; the USAP ships spend their time crisscrossing some of the roughest oceans on the planet. And when it’s calm, gliding through some of the most unspeakably beautiful, remote places in the world. Ports of call when you came off the ice were mythical spots in the southern oceans – Tasmania, Tahiti. I’d yearned for a position on one of the ships from the moment I knew they existed. Conditions are difficult – freezing rain on a pitching deck, 12 hour days, 7 days a week – but competition for positions is intense. And now, out of the blue, there was a chance? There was a different bit of terrifying, too, more frightening than the long hours and pitching decks: the position they needed to fill was sysadmin. At Pole, I was the Helpdesk guy. If I couldn’t fix a problem, there was Daniel, the PC tech as a backup. If he couldn’t fix it, there was Ben, our all-knowing sysadmin, who could fix anything. On the icebreaker, they don’t have a PC tech or Helpdesk guy. They have a sysadmin. If something computery breaks, network or laptop or server or switches, there’s one guy to fix it. I would be that guy. Frightening amount of responsibility – if I failed at my job, the icebreaker would be offline. Sorry, no science happening on this million dollar a day Antarctic research vessel – our sysadmin can’t fix the network. Pressure? Just a little. In theory there’d be plenty of time to come up to speed on all that WindowsLinuxServerPacketSwitchDnsConfigurationVirtualization stuff that I’ve used only casually – the slot USAP was looking to fill started in March. But… I’d just started to enjoy my groove here, sitting comfortably in my little Palo Alto hermitage, puttering away on housework and spending afternoons baking and writing. But… Antarctica. The icebreaker. Brains #1 and #2: Wait…what? And so it went for about a week. 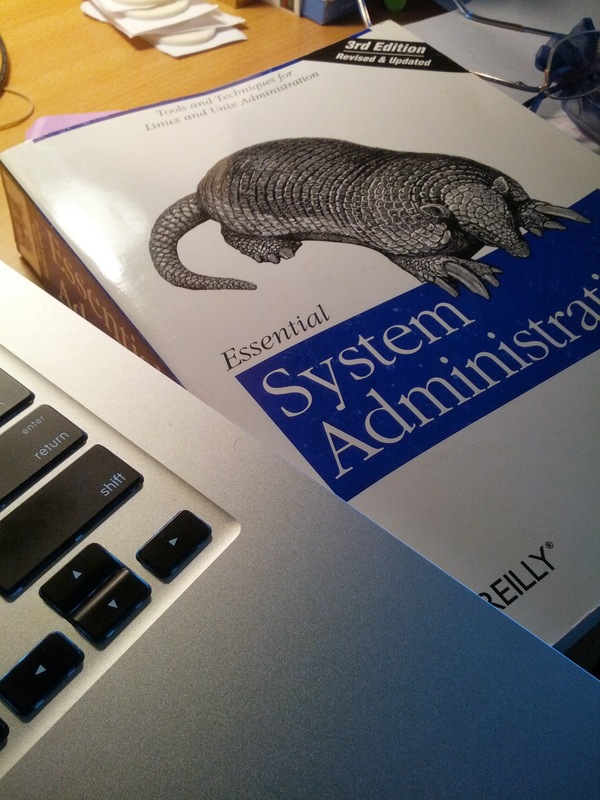 Then I went down to Fry’s, bought “Essential Linux System Administration”, and – with Devon’s blessing – put my resume in. You all knew I would, didn’t you? It is amazing how much you can pick up quickly, throwing together a little home network under your desk. I was enjoying getting my head back in the game, futzing with grep and awk all those arcane system commands that look like a transcription of somebody choking on an olive. I didn’t want to jinx it by telling everyone, but I was actually feeling like, given the time between now and March, I could actually handle the job. Well, by now you’ve probably heard about the ripples from the Federal shutdown. The Antarctic logistics pipeline is so long and so delicate that the shutdown has pulled it right off the tracks. Even if Congress got together this morning for a big round of Kumbayaa and signed a budget agreement, the USAP can’t recover. Not this year. The entire program has gone into shutdown mode, preparing to bring the stations into “caretaker” mode and bringing home everyone they can. No research, no science, just a minimal crew to keep things from irreparably going cold. And of course, no icebreaker. There’s an enormous amount of sadness and anguish here – marine biologists whose life work depends on an unbroken chain of observations, climate research that will now have an crippling gap in the data. Me, personally? I’m a little sad that I don’t get to go south. But I’m heartbroken at the effect this is having on science, and the lives of those who really depend on this work. There are obviously a lot of strong feelings about this – for one particularly eloquent exposition on this, I refer you to Genevieve’s Ice White and Blue blog. So there ya go. There wasn’t a chance I’d get to go, then there was, and now there isn’t again. Selah. Other adventures await, and if we, collectively as a nation, get our frankly embarrassing act together, maybe someday I’ll get to go back and retrieve that little bit of my heart that I left somewhere out on the ice of Antarctica. It’s so upsetting to see so many dreams being destroyed by a few men having a temper tantrum. Antarctica is more than just a job, it’s a home to so many. The vessel would have been such an amazing opportunity, and I hope you get back down there again in the future! Wonderfully written, Pablo. I am sorry we never overlapped at Pole. I’ve done 2 winters there and they are game changing indeed. Thank you for being so kind about my blog. > You all knew I would, didn’t you? Thanks for the update, and for reminding us of the consequences. Uhhh… hope that I somehow anti-jinxed myself? And keep studying the hell out of that Linux Administration book!